Creates a tree listing of the directory tree just as Explorer does. It lets the user navigate through his file-system, and choose a file or folder. Directory$ The directory that will be initially selected. It can include one or multiple patterns, like "C:\*.pb;*.pbi". If no pattern is included, the directory must end with a '\'. Including no directory will display the root containing the drives. Including no pattern defaults to '*.*'. So a Directory$ of "" will display the root and set '*. *' as pattern. #PB_Explorer_BorderLess          : Create Gadget without borders. #PB_Explorer_AlwaysShowSelection : The selection is still visible, even when the gadget is not activated. #PB_Explorer_NoLines             : Hide the little lines between each node. #PB_Explorer_NoButtons           : Hide the '+' node buttons. 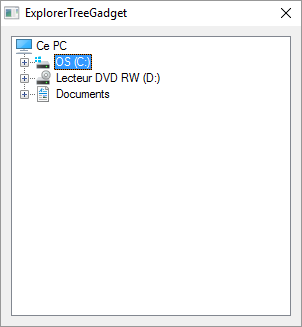 #PB_Explorer_NoFiles             : No files will be displayed. #PB_Explorer_NoDriveRequester    : There will be no 'please insert drive X:' displayed. #PB_Explorer_NoMyDocuments       : The 'My Documents' Folder will not be displayed as a separate item. #PB_Explorer_AutoSort            : The content will be sorted automatically by name. - GetGadgetText(): Get the full path of the currently selected directory/file. - SetGadgetText(): Set the currently selected file/directory. - GetGadgetState(): Check if the selected item is a file or a directory. #PB_EventType_Change           : The selection has changed. #PB_EventType_LeftClick        : User clicked on an item with the left mouse button. #PB_EventType_RightClick       : User clicked on an item with the right mouse button. #PB_EventType_LeftDoubleClick  : User double-clicked on an item with the left mouse button. #PB_EventType_RightDoubleClick : User double-clicked on an item with the right mouse button. #PB_EventType_DragStart        : User tried to start a Drag & Drop operation.